An audio recording that appears to capture the heartbreaking voices of small Spanish-speaking children crying out for their parents at a US immigration facility took center stage in the growing uproar over the Trump administration’s policy of separating immigrant children from their parents. In this photo provided by US Customs and Border Protection, a US Border Patrol agent watches as people who’ve been taken into custody related to cases of illegal entry into the United States, stand in line at a facility in McAllen, Texas on Sunday. Brownsville, Texas: An audio recording that appears to capture the heartbreaking voices of small Spanish-speaking children crying out for their parents at a US immigration facility took center stage Monday in the growing uproar over the Trump administration’s policy of separating immigrant children from their parents. “Papa! Papa!” one child is heard weeping in the audio file that was first reported by the nonprofit ProPublica and later provided to The Associated Press. Homeland Security Secretary Kirstjen Nielsen said she had not heard the audio but said children taken into custody by the government are being treated humanely. She said the government has high standards for detention centers and the children are well cared for, stressing that Congress needs to plug loopholes in the law, so families can stay together. 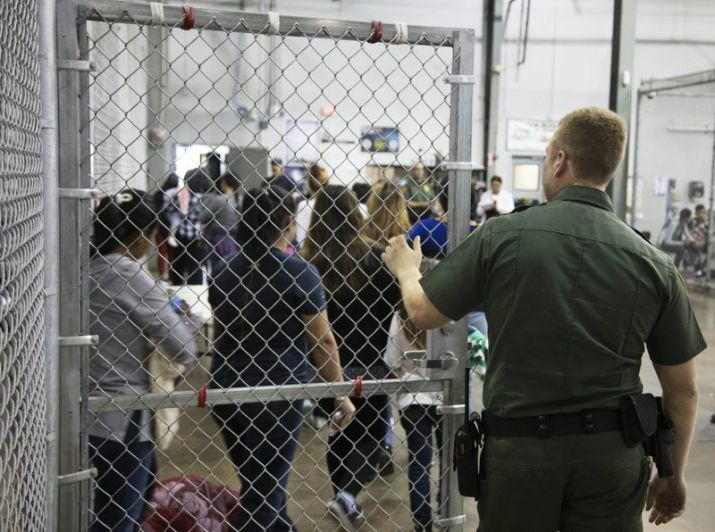 The audio surfaced as politicians and advocates flocked to the US-Mexico border to visit US immigration detention centers and turn up the pressure on the Trump administration. And the backlash over the policy widened. The Mormon church said it is “deeply troubled” by the separation of families at the border and urged national leaders to find compassionate solutions. Massachusetts Gov. Charlie Baker, a Republican, reversed a decision to send a National Guard helicopter from his state to the Mexican border to assist in a deployment, citing the administration’s “cruel and inhumane” policy. 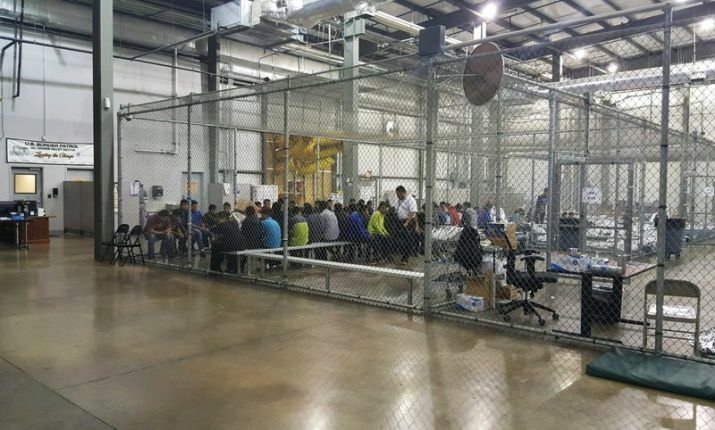 In this photo provided by U.S. Customs and Border Protection, people who’ve been taken into custody related to cases of illegal entry into the United States, sit in one of the cages at a facility in McAllen, Texas, Sunday, June 17, 2018. Attorneys at the hearings said the immigrants had brought two dozen boys and girls with them to the U.S., and the judge replied that he didn’t know what would happen to their children. Democratic Rep Ben Ray Lujan of New Mexico said the location was a former hospital converted into living quarters for children, with rooms divided by age group. There was even a small room for infants, complete with two high chairs, where two baby boys wore matching rugby style shirts with orange and white stripes. In Texas’ Rio Grande Valley, the busiest corridor for people trying to enter the US, Border Patrol officials say they must crack down on migrants and separate adults from children as a deterrent to others trying to get into the U.S. illegally. “When you exempt a group of people from the law ... that creates a draw,” said Manuel Padilla, the Border Patrol’s chief agent there. “It so challenges the conscience of our country that it must be changed and must be changed immediately,” she said during a news conference at a San Diego terminal that is connected to the airport in Tijuana, Mexico, by a bridge. US Sen Ted Cruz of Texas announced late Monday that he was introducing emergency legislation intended to keep immigrant families together. President Donald Trump emphatically defended his administration’s policy Monday, again falsely blaming Democrats.